﻿"My slow season was almost non-existent and my business has totally transformed"
﻿"I've increased my business by $438,320 in 2014 using these systems"
﻿"I would not have been prepared to take on the extra $263K in business if it weren't for this program, thank you." 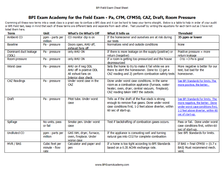 BPI Field Exam cheat sheets for your open notes field exam. Having months of materials thrown at you in 5 days is not the best way to get a deep understanding of what you are actually doing. 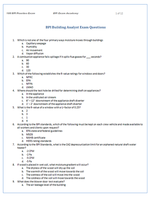 Use these cheat sheets as a reference during and after the BPI Field Exam as a quick reference to help straighten your path to second-nature understanding so you can concentrate on where the problems are not the logistics. 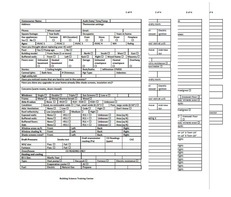 Energy Auditor Field Sheets, time tested and refined for over 5 years and the same field sheets my auditors use. If you are working for a company doing audits after a month or two of experience, sit down with the owner and offer suggestions from these field sheets to add value to the company and propel your career. If you are a business owner use these field sheets to help smooth the transition from auditor to crew as you grow your company. Top 5 Ways to Quickly Fail the BPI Field Exam Checklist. The BPI Field Exam is more often failed than the Written Exam. Don't start off on the wrong foot by making unconscious mistakes you only realize after the exam is over. Take this guide with you into the exam as a fail-safe on the way of your BPI Certification. Should you 1099 or W-2 your employees? The single most important question every home performance owner should ask themselves if they want to grow their business. The 2 essential TRIGGERS that you must implement to create raving fans in your business like clockwork. Detail the exact steps I took to build my home performance business to 1 million in sales. Learn the 9 Steps to Operations Independence. For HP professionals who want time tested, plug and play solutions to increase their revenues and build strong foundations so their growth and expansion can take off. Swipe & Deploy Field Guide templates to immediately improve your operations. Like all energy auditors and home performance contractors, you have to take a fair number of risks in your life, so we though we'd remove one from the equation by making our program risk-free. Give our Thrive Program a good, honest try. If it's not working for you, tell us within 30 days of purchase along with two proofs of implementation of our tips and we'll refund your money - no questions asked. LAUNCH YOUR HOME PERFORMANCE BUSINESS NOW! Now is the time to take your energy audit business to the next level. The Home Performance Growth Kit is your guide!